I no longer use this can. It is not perfectly round but still is good. No charge, just pick it up. I might be interested in that free trash can. You say it "could use a washing". After a good washing with some soap and hot water, do you think it would be suitable for use as the "punch bowl" at my annual back-to-school Jungle Juice party? The can I used last year was not clean enough, and a lot of my friends got really sick. I don't want THAT to happen again! Personally I would never use a garbage can that has been used for garbage for anything other than compost and garbage. Besides, this isn't a small can. The size is no problem, my friends and I drink like Ron White on Dr. Phil's yacht. But I suppose you are right, it's probably not suitable as a punch bowl. You think I would have learned my lesson last year, LOL!! Anyway, what about a kidddie wading pool? After a good washing do you think it would be OK for kids to take a dip in? I mean, if I make it real clear to them not to drink the water? try using it for garbage or recycling of garden waste. My friends and I like to put on backyard wrestling shows. They are actually pretty good. We were even on the six o' clock news once. 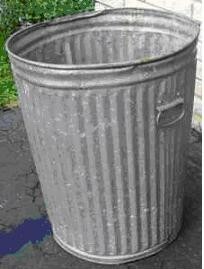 Since it is the classic metal garbage can we would like to use it in our next baseball bat, garbage can, barbed wire, no-disqualifications, win-by-submission-only match. When would be a good time to pick it up? The can is outside of my home. You are welcome to pick it up. I have told someone else the same thing. Just come by and pick it up. First come, first gets it. I give full credit to my friend George for the "Backyard Wrestling" email. It was his inspiration, copied virtually word-for-word. "Now she has done it. She has set herself up by allowing two people to come claim it. You need to find some buddy and you arrive in two separate cars very close in time. Then you start bashing each other with the can like wrestlers do and she thinks the two people she has let have it are now fighting over first come first served. When she comes out to break it up, you leave and make the comment you don't want it now since it is dented and banged up." George is one of the few people I know that is more screwy in the head than I am.